With the holiday season almost upon us this was always going to be a busy time for smartphones but one in particular is amassing a huge amount of attention right now. The LG Nexus 4 phone is the latest Google Nexus phone and released only two days ago running the latest Android operating system, 4.2 Jelly Bean. This was a huge draw and sadly stocks of the Nexus 4 were sold out extremely quickly. It appears that Nexus 4 sales will be hectic for Christmas so let’s hope that Google gets plenty more supplies very soon. On the day of the LG Nexus 4 release we spoke about how the Nexus 4 phone and also the Nexus 10 tablet were receiving an OTA update offering some extras. 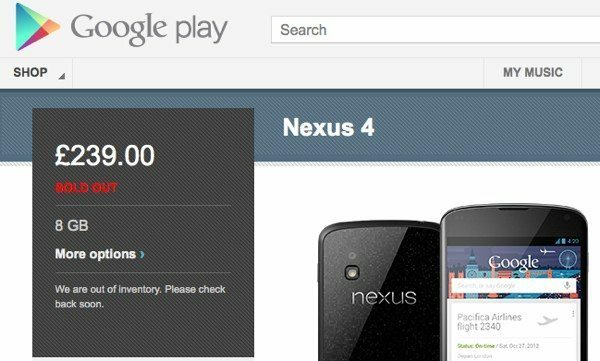 Even though this was very soon after the Nexus 4 went on sale through the Google Play Store we had comments from readers saying they were having trouble ordering it, with either the site crashing or being told the device was already sold out. Further to this we posted an article explaining that both the 8GB and 16GB Nexus 4 were already sold out through Google Play only hours after the release and this made us wonder how many of the devices had actually been in stock ready for sale. Many of our readers commented on this and some were frustrated and disappointed by the numbers that Google actually had for sale. Of course it’s difficult to ascertain whether the shortages of the device were actually due to not enough being produced whilst erring on the side of caution, or whether the manufacturer and Google thought that they had plenty of stock but demand was so unprecedented that it soon turned out it had been wildly underestimated. Looking at the Google Play Store today it’s no more promising. Again the product page for both the 8GB version and also 16GB version still show the LG Nexus 4 as sold out with a message saying “We are out of inventory. Please check back soon.” There’s no option to purchase with an estimated time of delivery, as you just have to keep checking for when it becomes available again. We’ve checked the UK store but this seems to be the case in many other regions too and so far there’s no indication at all of when Google expects the phone to be back in stock. If you’re in the U.S there is an alternative as the Google Play Store was selling the Nexus 4 unlocked but the phone is now also being sold through T-Mobile on contract as we detailed here. T-Mobile USA is also selling an unlocked Nexus 4 but at a much higher price than through Google Play. We would certainly imagine that at this very moment production of the Nexus 4 has been stepped up to the maximum but even if Google gets more stock in shortly it seems likely that it will quickly sell out again. One thing that Google really needs to get on top of though is concentrating on enough supplies of the Nexus 4 to cover the major Christmas rush as if stocks of the Nexus 4 continue to be scarce then there are likely to be a lot of disappointed consumers out there. It would be a shame if the fact the unlocked Nexus 4 is so reasonable priced through Google Play (at only Â£239/$299 for the 8GB model or Â£279/$349 for the 16GB), leads to criticism about its non-availability though. We’d like to hear from readers about the Nexus 4 and the lack of stock. Did you manage to get yours straightaway or are you one of the many who have yet to make your purchase? Does the lack of any availability date frustrate you? Send your comments to let us know. I got the email saying it was on sale at 8:36AM UK time and I didn’t get on until an hour after around 9:37AM. Although apparently it went on sale at about 8:15AM. You’d expect they’d have enough stock for 2 hours at least right? Apple sell in the millions and can do it, so why can’t Google? I got my email at the same time but I was already able to add to my cart about 8:15. The screen had my card details & address, asked if I wanted to have the phone automatically synced to my google account, etc. It told me it would take 2 days to receive only to then get an error & it tell me my basket was empty – not happy. hahah same thing happened me !!!! I wanted 1 x 8 Gb and 1 x 16 Gb, all the 16Gb were sold out, so I put the 8 in my basket and then I got an basket error too when I went to checkout, and when I tried to reorder it was gone !!!! It’s a quite annoying I’m sure they already knew they would run out of stock at that price, I’m still hopeful I’ll get one before christmas, Pssst google If youde like to throw one my way I wont argue . it is an absolute shame for google to mess up the sale. servers crashing, one gets the doubt that is the phone really upto specs? Bcos of their bad planning in sales, one gets this doubt. Damn with google and their phone. You may not commercially resell any Device, but you may give the Device as a gift. I don’t think they can legally prevent resale, at least in Europe. This has peeved me off to no end, some people ordering 30+ devices at a time are now on ebay. Selfish, greedy people out there. No doubt google will now up the price to Â£400. If you really want Nexus 4 then you can wait a little bit more. If you are ready to choose an alternative so soon then it means you did not want the device enough. plus they were collecting email addresses from interested people. I’m guessing you didn’t try to buy the phone on the 13th? Whats nonsense is the fact that the Play Store was acting up and couldn’t cope with the traffic. <That's not heresay I was on the play store at release and it was horrible. They will be back online soon! I doubt it, those who ordered before it sold out have been emailed and advised that the shipping ETA is up to 3 weeks now. again when the phone is back on sale â€“ for Xmas!! Â£399 from O2 for Pay & Go. As much as I want one, I won’t be paying an extra Â£110 for it! Just as well I didn’t part with that much cash – just traded in my Nokia Lumia 800 for the difference 🙂 Only had to pay Â£30 above what I would have done had a managed to secure it from Google. Might as well say “I traded my car for the phone, therefore didn’t spend a dime on it.” How much does a 800 sell for? Daft way of looking at it, you still paid over the odds for it because you couldn’t wait a little longer. Â£110 could have gone some way towards something else such as a Nexus 7 or even a damn good night out. I think that it might just be googles marketing tactics. I mean this happened with the nexus 7 when it launched, but two weeks later when they restocked they didn’t run out. Having it sell out in less than an hour is a publicity stunt. It gets headlines and stirs up anticipation for the device. Give it a fortnight, there will be stock, and plenty of it. I mean they couldn’t have not anticipated the demand, after what happened with the nexus 7 and all of the “notify me” email alerts they were going to sell. I was on the “Notify Me” when available list on the Google Play Store and was eagerly waiting to replace my phone on the 13th but didn’t know the time of release, thinking Google would “Notify Me”. Never got the notification and checked at 11:30 and 2:00, too early and too late. I’ve been waiting for this phone for two weeks and am very frustrated it sold out. If it was purposefully underproduced – bad move, it this phone isn’t available soon, I’m going to have to start looking at other options. I had placed my mail id on site so that google would notify when it is on sale, but poor salesmanship by google, that it didnot send me a mail. I was sitting by computer, refreshing page every few seconds so that I can order as soon as it is on sale. I knew that site would be flooded with buyers due to low price. But unfortunately, i went to take a dump, and it was sold out by the time i returned. it was a complet disappointment been wting for so long and wking up whole night and still wont be able to buy it wat a shame…………..
Why didn’t Google just take pre-orders and then they would have known exactly how many units to produce and ship on November 13. Selling out in less than an hour is ludicrous.